You can use G-Lock Analytics service to track your emails so you know if they were opened and read. 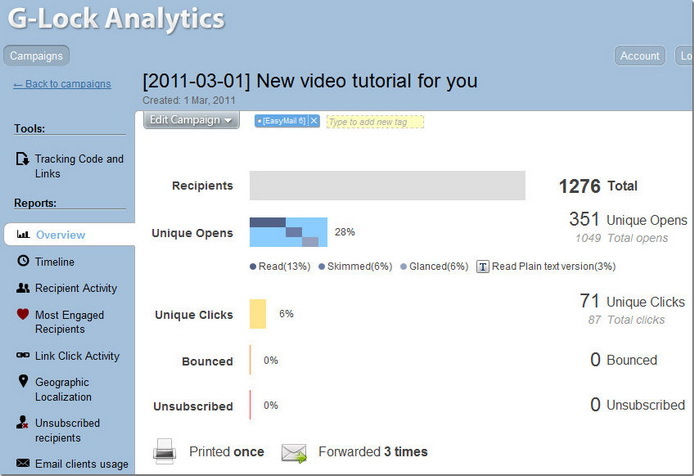 Email blast tracking reports are presented in the textual and graphical format. You can also view the geographical localization of unique opens of your email message. With these types of reports you can figure out if your customers find your emails interesting, or what part of them they like more. If you are selling products online, and you send out a regular newsletter with a list of new products, you could use G-Lock Analytics to see what your customers are most interested in. Setup a free account on G-Lock Analytics now to test how the email tracking service works. Using a free account you can track up to 1,000 email opens and have 3 campaigns at the same time. If you like the service, you can upgrade the free account to the paid one. Here you can read about G-Lock Analytics plans and pricing. If you are using G-Lock EasyMail7 as email marketing software, read this tutorial how to track email opens and clicks. If you are using any other email marketing software, download this User Guide how to track email campaigns with G-Lock Analytics (PDF). Do You Send Your Emails at the Right Time? Reach the inbox every time. Improve your deliverability by scanning your emails through all the major spam filters before you send. Get the data you've never had -- if your email was read, forwarded, printed, or deleted. Brand your tracking links with your own domain, and much more. Try EasyMail7 for free today! Import your subscribers, add any smtp and send emails with confidence at a fraction of the cost it would have been with any ESP.